Will the market correct? If so, when? Will the nearly decade long market bull run continue to roar ahead? Who knows?! Maybe that’s surprising to you as a passionate investor as well. I’m come back to that point in a bit. For now, the market highs are pretty amazing stuff. The S&P 500 share index, tracking the 500 biggest public companies in corporate America, has gone nowhere but up over the years. About 3,500 days up in fact – without a fall of 20% or more. Somewhat mind boggling when you think about the returns over the last decade for the U.S. market – if you were invested that is! Using Vanguard’s VOO S&P 500 ETF as an indicator, you would have tripled your money had you invested in the American market in late-September 2008 and reinvested all dividends paid for a generous total return. We own 32 established Canadian companies that pay dividends every month or quarter, companies that tend to raise those dividends at least once per year. You can read more about dividends here. 22 of these 32 companies have already increased their dividends this year. Beyond some Canadian and U.S. stocks we also own a couple of low-cost Exchange Traded Funds for income (via distributions) and growth. You can read more about ETFs here. Regardless if the market goes up or down, we save and invest and a couple of times per year we deploy capital into more stocks or low-cost ETFs to grow the retirement nest egg. 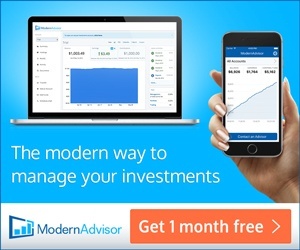 Admittedly it’s a very boring approach to money management – but the plan is working. 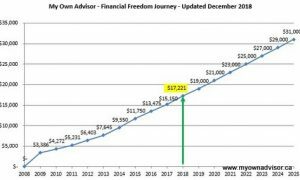 At the time of this post, our spreadsheet tells us our dividend income should be more than $16,750 in tax-free and tax-efficient income this calendar year. This is excluding RRSP assets we’ll draw down in our 50s and 60s. In fact, almost without fail thanks to reinvested dividends every month and quarter our passive dividend income rises by about $50 per month – without any new investments. Pretty cool. That means at the end of the day, whether the market rises or falls, whether NAFTA talks that influence the market fail or succeed, I’m going to be on my best behaviour and let our investments do their thing. Time in the market remains our friend. I’m optimistic the companies we hold should survive any major market storm that’s bound to come, and continue to pay out their dividends as they have done so for decades beforehand. Beyond holding a basket of Canadian and U.S. stocks, I also believe our low-cost equity ETFs will continue to grow over time. The combination of both stocks and ETFs that hold stocks across our portfolio should help us realize our financial goals. I’ll keep you posted on the journey next month. How is your income growing to support any retirement dreams? Share in a comment below. 39 Responses to "September 2018 Dividend Income Update"
are some of your dividends in non registered accounts? 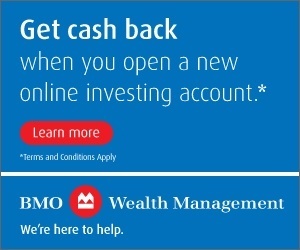 I am assuming this would be the only alternative place to put them when you have maxed out a TFSA and RRSP. Do you get concerned though about paying taxes on this dividend income and how it may affect your OAS amount down the road? Yes, some of them are Sue because my TFSA and RRSP are both maxed out of room this year. Not at all. If I have a tax problem in retirement, along with my health first and foremost, these are excellent problems to have! I hope so cannew….the power of compounding starting to work in front of my eyes. Rest assured, the market will correct. The more I read of people “getting into the market” the more worried I become. In spite of all the bravado of people claiming they can ‘ride it out”, I don’t believe the vast majority of people will and they will just exacerbate the problem. Great point….re: the more folks get in the more dangerous it becomes. We’ll see if I can ride it out myself! Yep it will correct. When? Dunno. How much? Dunno. Hoping to ride it out. Maybe it will be the first one I can’t. But I doubt it. Mark, good job on the steady progress. Good answer…”don’t really care that much”. Hard to say how I will ride it out. I’m hopeful as long as my dividends don’t get cut I should be able to. All signs are pointing it could be very, very messy. I agree it could be very messy or not. However if you’re still in accumulation mode/employed even very messy should be manageable and may even be an investing opportunity. Those relying on dividends and/or on equity capital growth to live will have the toughest test. Although some FI faces challenges too. To me there will always be some dividends that will be cut at some point over an investing lifetime. I expect it. I was taking your “don’t really care that much” figuratively – focus on what you can control and on the long game. Truth is most of us will care a lot but the question is how many will act rashly in that situation and in a way that may be against their long term interests. Some haven’t experienced very messy, or maybe its even worse in the next one. I think lots of world wide bonds may implode first or be the cause of market chaos. Debt everywhere is staggering. That’s kinda the point I’m at. I felt the risk of potential significant downturn is far greater than any potential of much more upside so I went a little more defensive last fall. I still have a majority of invested assets in the market but have enough GICs, that combined with the pensions, will be sufficient to sustain our current life style barring world wide calamity. In a nutshell, I just don’t see much potential for much more economic growth. What could possibly drive it? Similar here but I have been much more defensive/conservative (40% FI) from less than 5% since retiring 4.5 yrs ago. So its been a while. I would think there will be a “reset” with all this debt, US market tops etc neeeded soon before we can resume much more growth. But my prognosis haven’t proven to accurate over many years, and we need a little more “security” now that we’ve “won the race” (or at least reasonably so to meet needs), so hence the balance in funding retirement. Some have a very different approach and I respect that. Lloyd, maybe you would find this interesting. I’m on their daily mailout and this was todays offering. I am about 35% bonds/cash right now. Still buying last month and turned out not wise. Anyway, I feel as we are not retired yet we should be able to ride the coming downside out, and maybe use it as an investment opportunity. That is, if we do not panic at the market bottom. I didn’t pay that much attention to the market at all during the financial crisis. Was a new mom and have many other things to worry about. This time, just as RBull said, even we managed not to panic, but I doubt I could have the attitude of “don’t really care that much”, I will care a lot for sure. The possible impact of a big fall could be: I panicked and sold on bottom and have to delay my retirement; I caught to chance to invest in equities with my bonds/cash and retire on schedule; I took a risk to invest not only with my bonds/cash, but also leverage my heloc and retire early. Time will tell which one becomes true. That’s probably a great thing to be honest…it might be why you’re doing well now! You didn’t pay attention, you simply saved and invested and didn’t worry about the rise for fall of your portfolio. No stress. I personally think it will be slow downward spiral coming. Not sure how big the fall might be. Maybe eventually close to -30% or -40% at the bottom? Hopefully whenever the event happens we can muddle along without much income disruption and hope a return bounce on equities happens and in a reasonably short time frame. I have some written plans for rebalancing whenever we have a significant downturn but who knows if I can execute accordingly. My allocation goal is 80/20. I am not able to get there due to being scared by the long long bull. Would you consider selling buying or some equities May to get there in a dollar-cost approach/limping in? Ya, it could be an opportunity for us. It’s true, I “don’t really care that much” since that is the context I’m trying to live in – think about and worry about the things I can control vs. not. That mindset is helping at work lately…given I have very little control over anything. I’m not relying on growth in the coming years, just mostly dividends for “living from”. If those are potentially cut across my portfolio then I am in trouble. Then again, I can always decrease spending if I have a 100% equity dividend stock + ETF + emergency fund focus. I often wonder if a 60/40 or 70/30 allocation with $1 M in the bank is better than 100% dividend stocks + ETFs + $50k emergency fund (also $1 M) is better to live from. The latter is more of my plan. I guess I simply see dividends being a buffer for riding out bad markets without selling bonds (part of your capital) and you still get the capital upside over time when things recover after 1-2 years. May, I hear ya. If stocks were really on sale it’s easier to buy, although I don’t what that number is. So the easiest way for me to plan is buy/sell whatever it takes to keep me close to my target allocations based on some written rules. Although, if you haven’t been at 80/20 before or it’s been a long time maybe your overall comfort zone is a little lower. Also there’s plenty of Canadian stocks that aren’t too expensive now. Nice work with the focus on your own stuff that you control at work. Yeah, most of us are in trouble if all/most dividends got cut. That would signal serious issues in the markets of course. My FI % yield is almost the same as my equities overall averages. It has moved around some, has been higher than equities and currently a little lower. However they don’t hold the capital gains potential or benefit of the div growers but neither is there much downside risk, and there is no need to sell FI other than to rebalance as plan directs for proper allocation. We are living on the payouts of these now. For us similar income wise as if holding all equities. We could lever up yield and therefore income (and probably grow it better) if we moved equities to more/all Canada but that doesn’t fit with our plan/needs. We hold fewer bonds (almost all individual corp bonds held to maturity, 1 small RRB etf position) and more GICs now. It’s always good to question your current plan to either find holes in it or reinforce why you’re staying there. The answer on allocations depends on your needs and comfort/risk tolerances so I don’t think there’s any one right answer. Good link Bull. It’s beyond my comprehension level for the most part and it sorta makes me feel like I’m not paying enough attention to the whole system. You can now afford to procrastinate Lloyd because you have earned it 🙂 You have “enough”. Kudos. lol…I’m going to frame that and show the wife. I have permission to procrastinate and it’s all Mark’s fault! When I was in China a few years ago for 19 days it was an eye opener re growth. Take all the construction in all of Canada and you might equal what’s happening in one (1) of their larger 100 cities. We were in cities we never heard of with populations nearly our entire country. Crazy. With our current lifestyle (much towards travel) we can’t afford to drip all equities and now use interest, dividends, distributions to fund lifestyle & top TFSAs, which are the only accts we drip (100% CDN equities). Tapping capital at some point is a whole other issue that we’ve discussed on here before. I’ve never been to Asia yet. Would love to go! @Mark, I hope I have done what you said. Unfortunately I just did the saving part, not the investing part. That’s why @RBull, I am still struggling to get to my allocation goal. I started from about 30/70 with tons of cash, and now at 65/35. I have started quite a few new positions since last summer and some of them doing great (CP with 45% gain in one year), some of them doing bad (all utilities and pipelines). Overall, I don’t regret what I have done and wanted to ride the downfall out and continue to get to my goal. @Lloyd, agree with Mark. You are in such a great position that you can do whatever financially you would like. Hopefully one day we will be in a similar position if I played my cards right (at least not too wrong). @May, now I get it. Sounds to me like you’re making all the right moves given your situation and goals. Strategic buying and focus on the long term. @Mark, I’m certain you’ll get there! So far for us in Asia it’s just China, Hong Kong, Macao and short stints in Singapore, Vietnam and Thailand for us. Nice mark! love that you are adding over 50 bucks a month in forward income with drips. That is fantastic. I added 24 last month normally its around 14 bucks. Nafta is all good now and the market didnt do much, beside a couple stocks. Atleast the canadian dollar bounced up a bit! Yeah, all the predictions with NAFTA or USMCA or whatever they want to call the new version are already baked into the market. Us retail investors have no leg up at all. So, that means for me, buy stocks that have dividends for generations and invest in low-cost ETFs and I’ll get whatever I get. So far, things have worked out and I hope they will in the coming decades too. Thanks for being a fan. I’ll check out your latest articles this week. Sure , when Market going up and became rally, everybody join it,,,,the way it going…when it will be corrected is the question and going out from market on time or measure it, not easy or possible. People were saying since TSX reached 13K……. I would like to hold my cash until some dip comes in. But Dividend fund are the best way to earn from the your money lending to market. What happen to the index funds when market goes down? Does it loose , Isn’t it good time to buy. Please advise. That’s the thing eh? Oh, this is a new high, “it can’t go any higher?” Right. Predictions while fun are useless since it’s very difficult to predict anything we any accuracy. It’s been a great decade for investing. My wife and I were lucky that we just started our careers when the financial crisis rolled around. We lost a bit, but ended up benefiting in the long run through consistent dollar cost averaging. Even if the bull market ends tomorrow we have a pretty conservative portfolio (for our age anyway) and will enjoy the chance to re-balance from bonds into stocks. Smart stuff Owen. So do you hold any stocks directly at all? Or just ETFs? We can consider an investor profile as a follow-up to your help with this one! Mostly ETFs but we do hold a couple of stocks directly, they’re from employee share purchase plans at previous employers. There is a tax liability, so I’m reluctant to sell them at this point, perhaps during a low income year, or we’ll hold them for a while and use them for donations in the future. Our goal is to keep them under 5% of our portfolio so any dividends get reinvested into ETFs, over time that should reduce their relative size. Thanks Mark, glad I stumbled onto your site several weeks ago. Lot’s of similarities when it comes to investment approaches. Mine is long term buy and hold with dividend stocks for Canada including your typical solid Banks, Utilities, Telecoms, and REIT’s. Outside Canada I keep it simple with a low cost SP500 ETF and a handful of US Consumer/Healthcare stocks as both sectors domestically are rather weak. (Free healthcare = not so profitable) US dividends are reinvested in a low cost US Dividend ETF to mimic DRIP. Everything else is wrapped up in one World ex US ETF which does not include EM as it not transparent enough for me. Goals: hope to end the year with $250k invested capital and >8K annual dividend income. Nice to hear from you Ben. I hope you subscribe so we can continue to interact. Yeah, I figured a long time ago, the big companies that dominate ETFs like XIU in Canada are worth owning directly. You can see that further explained here. “Goals: hope to end the year with $250k invested capital and >8K annual dividend income.” Great of you to have some goals, I hope you nail them.